CHICAGO – For much of the first half of Monday's NCAA regional final, it felt as if Notre Dame could not buy a bucket. Some were good shots that banked off the rim or rolled, tantalizing, before falling out of the cylinder. Some shots were taken in haste or frustration and missed the mark. Either way, they missed. Luckily for the Irish, it didn't last. The team that shot 20% from the field in the first quarter stormed back to beat Stanford, 84-68, in the Chicago Regional final at Wintrust Arena to book a return ticket to the Final Four. 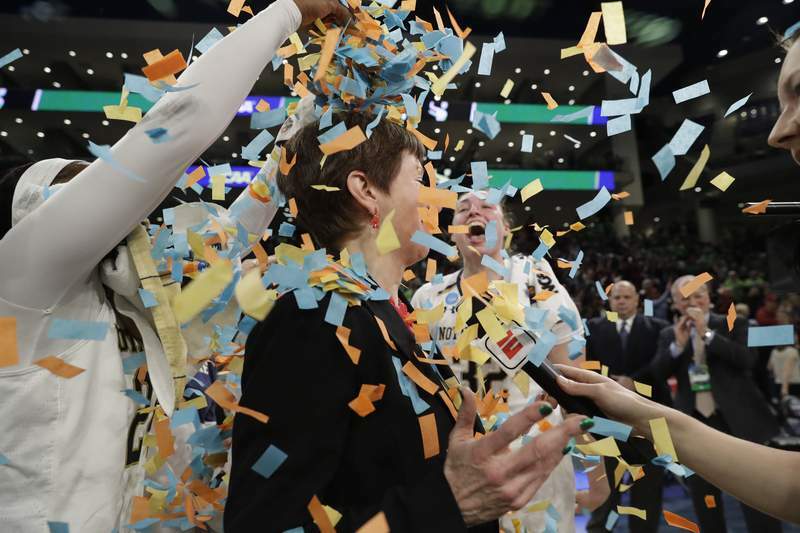 "Whew – that was unbelievable," Notre Dame coach Muffet McGraw said. "I think we looked just completely out of sorts, very unlike what we normally look like. I think credit Stanford's defense, they were hitting the boards hard, they were packing it in." Stanford led 33-26 at halftime and stretched the lead to nine points early in the third quarter before Notre Dame started chipping away. Two minutes into the quarter, Arike Ogunbowale drove down the lane and scored on a layup to cut the lead to 35-30 – the first time all game that it felt like the ball rolled Notre Dame's way. Two minutes later, Jessica Shepard grabbed a miss by Ogunbowale and put it back despite a foul by Alanna Smith. Shepard completed the old-fashioned 3-point play to pull the Irish within 37-33. Marina Mabrey, who has struggled with her shot for much of the tournament, hit her first bucket of the night and brought the crowd to its feet with a layup that cut the Stanford lead to 40-39 with 4:16 to go in the quarter. Jackie Young, who scored 19 of her game-high 25 points in the second half, got the ball on a fast break and drove down the lane to put the Irish ahead 45-44 with 2:09 to go and then hit a jumper to put Notre Dame up by three. Stanford then called a timeout to try and stop the bleeding, but the attempt to regroup failed. "I thought I was aggressive the whole game, and I just kept that same mindset, and the shots were starting to fall," Young said of the way she seemed to flip on the switch in the second half. "They were sagging off me a little bit, so I just had to read the defense and take what they were giving me." Notre Dame led 52-46 by the end of the third quarter. Stanford hit six of 10 3-point attempts in the second half to keep the game from getting completely out of hand, but it was soon clear that Notre Dame was hitting on all cylinders. Ogunbowale, who was named Most Outstanding Player of the regional, scored 13 of her 21 points in the second half despite leaving the game for a period in the third quarter after picking up her third foul. Brianna Turner scored 14 points, eight of them in the second half. Jessica Shepard scored seven of her 11 points in the final two quarters, and also had seven of her 14 rebounds in the second half, despite the fact that there were fewer missed shots to rebound. Young also recorded a double-double with 10 rebounds. "We knew that the shots were going to fall in the second half, and that's what they did, but I think it had a lot to do with our defense and just getting rebounds," Young said. Ogunbowale said the team focused mostly on themselves and their mistakes during halftime instead of discussing Stanford. "A lot of the mistakes and reasons that we were down was us, we weren't really holding good defense, we weren't getting rebounds," Ogunbowale said. "We could fix that without even the shots falling. We knew the shots were going to be able to fall the second half, but if we just held defense, it would get us back in the game, and with our shots falling, we could take the lead." Kiana Williams scored 20 points for Stanford, including 12 on 3-pointers, and DiJonai Carrington scored 18 for the Cardinal, who knocked Notre Dame out of the tournament in 2016 and 2017. "It's been out of my mouth, but it's a good win," Ogunbowale said when asked if Monday's win erased the bad taste of losing to Stanford in her freshman and sophomore years. "They gave us a great run, and they really played us well, so it's great that we came out on top." The win sends the defending national champions to their ninth Final Four in program history, where they will once again face 11-time national champion UConn. 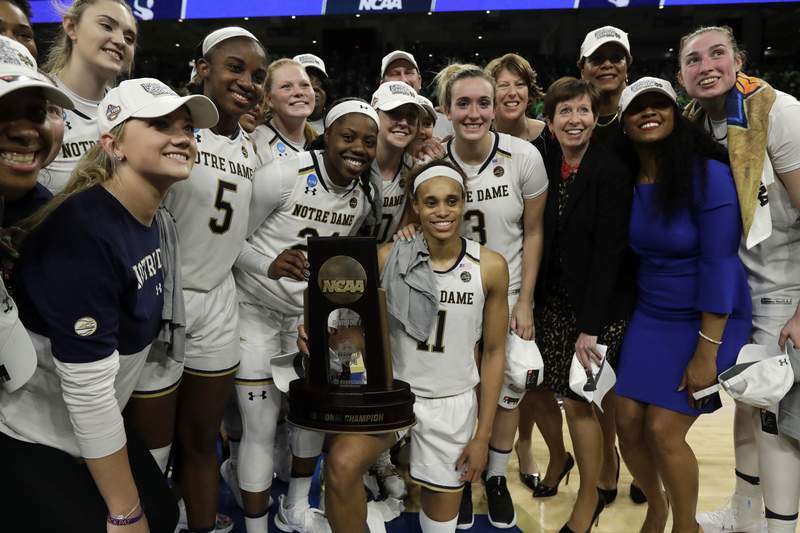 Notre Dame beat the Huskies in overtime in last year's national semifinal on a last-second shot by Ogunbowale. "Last year's game was a great finish, so I wouldn't mind seeing that again," McGraw said of facing Connecticut again. McGraw said that she was happy that Turner, a graduate student who missed last season with a knee injury, will be able to play in the Final Four this time around. "I think there's a little more relief than excitement, because we were a No. 1 seed who was supposed to get there," McGraw said of this year's trip to the Final Four. "Last year that team showed such resilience, it was kind of amazing that we got back."